After one side of the template has been drawn, shift the ruler to the drawn side and continue drawing on the other side. Occasionally check the drawing on the felt cloth by partially lifting the paper template. When the entire outline has been drawn with pen marker ink, check for gaps if there any, on the outline. With a pair of scissors, cut through the outline. Do not include the inked part on the antler cloth. Cut out the inked part so it is left with the scrap felt material that will be discarded. Put the cut templates side by side so the shapes reasonably match each other. If there are still inked portions, trim them off. Cut a 12-inch length of gauge 18 metal wire with a pair of cutting pliers. The gauge 18 wire is soft enough to be folded with your fingers yet strong enough to function as a frame. Fold the metal wire in half. Approximately 5 inches of wire will be inside the antler. The remaining 1 or 1.5 inch of metal wire outside the base of the antler will be reserved for gripping the headband. Bend the metal wire with your fingers so that the wire roughly follows the contours and shape of the antler as shown below. 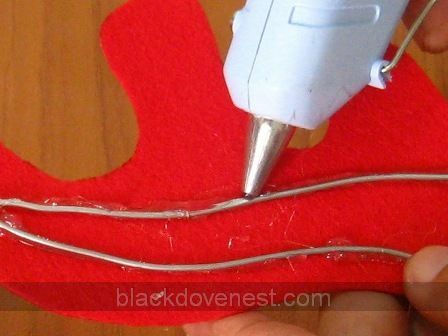 Use a glue gun to glue the wire piece with the felt antler piece as shown below. Don't worry if the glue becomes messy inside. This will be covered by another felt material. Apply the hot glue in short segments. Around 3-inch lengths may be adequate. Applying glue for longer segments may cause the glue to cool and harden prematurely. This prevents you from correctly securing the wire to the felt cloth. For each segment application of glue, wait for around 10 seconds for the glue to cool and harden before continuing to the next segment. 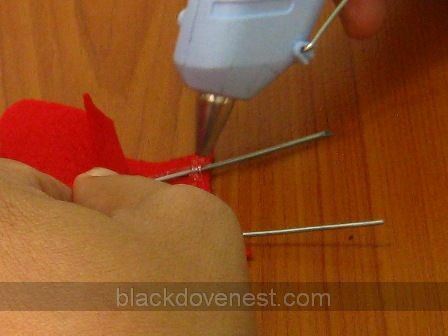 Ensure the glue is placed in between the wire and the felt material. This prevents wastage and binds the felt antler securely in the entire outline of the wire. When the on the wire has cooled and hardened, take the other antler and cover the wire frame. Position the cover so it aligns to the shape of the other antler. With both antlers aligned, lay them on the table. With your left hand's last three knuckles pressing down on the antlers, lift the base of the cover with the thumb and index finger. Apply hot blue along the base of the bottom antler. Apply hot glue on the felt material as well as on the metal wire on the base. With the knuckles still pressing on the antlers, lower the base of the cover antler. Press on the base until the glue cools and hardens. This initial gluing secures the cover antler so you may be able to glue around antler perimeter without worrying about the cover antler shifting. Continue applying glue to the rest of the antler horns.